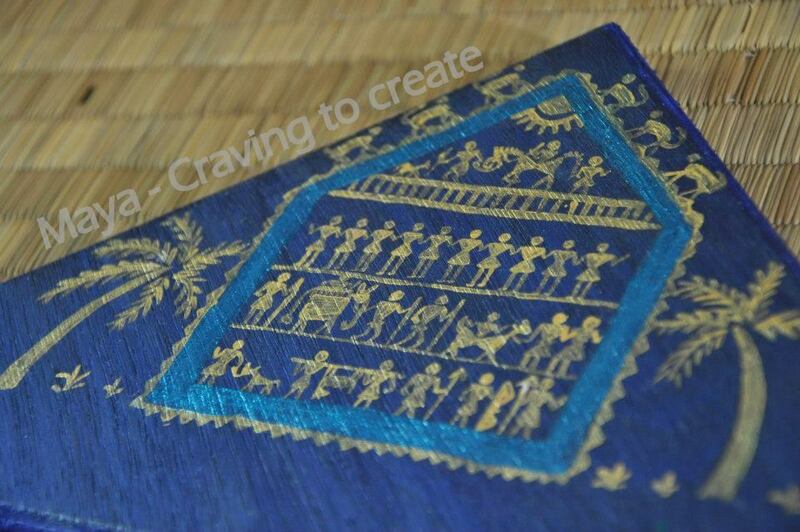 About the artist and author of this post: Ranjani Chandran is an amateur hobbyist. 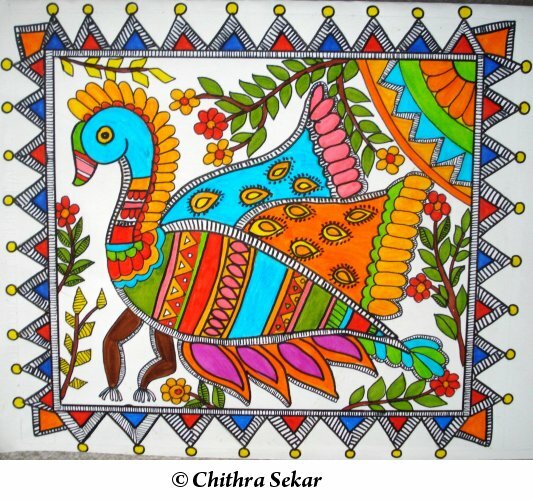 She loves painting, especially focusing on indian folk art and she tries and reuses as many discards as she can to upcycle them into intriguing pieces of work. She is also a foodie who loves to cook. She has been learning carnatic vocal music as a part of Mathrubrundam, an initiative by Dr. Seetha Rajan. She also likes photography, swimming and is currently learning kalari payattu which she finds very addictive. All this comes later! She has a humble home and two boys that she loves supremely ! Wood is one of the most interesting materials I have worked with after terracotta. That it had scope to be transformed into a piece of art is something I stumbled upon by accident. Carpentry work was happening at home and I was all alone watching over the house. Strewn with tools, pieces of reapers and cut out wastes of 6MM ply, fevicol, nails… and to inspire me my carpenter was perfect and patient with measurements and design. Watching his precision tingled a thought in my mind. I picked up the pencil, scale and the 6MM ply, and drew six 4-inch square boxes. Then I picked up his hacksaw when he was out for lunch and cut them out. My hands were killing me but the achievement factor kept me going. I had six pieces. Next I sandpapered it all to get a smooth finish on all four sides. He came back and his jaw dropped to see me do something so crazy! Now that I had the pieces, I decided to experiment with paints. This is how my journey started and Maya- Craving to create was born. Now, its my fourth year as a hobbyist and I can say that I am comfortable with a lot of media after so many experiments and the spirit to stop wastage. I would like to share with you how I go about this process and encourage you to try it too. Why? Because I think today recycling is a very important concept and ply wood can be beautifully recycled. Also we are now so equipped with supplies that experimenting will not really cost us much, on the other hand it gives us a moral boost – chance to feel like a five year old all over again. Keep a few things in mind before you venture into this for a better understanding. Make sure the piece is cut out properly. For eg: edges should have a precise 90 degree angle on all sides. Sandpapering all the sides is very important. This will give it the required smoothness. An 80 or 100 grade sandpaper will do the job for plys or all kinds, 4MM to 1-inch. Sandpaper is available in any plywood shop. Always apply termite control oil and leave the piece of wood for drying at least for 24 hours before starting art work on it. 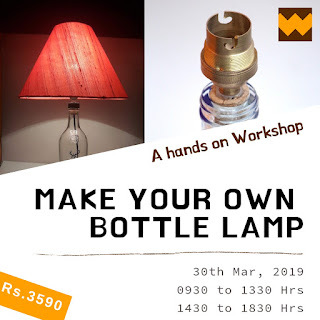 Termite oil is a tin bottle you can get in any shop that sells ply wood boards. It costs around Rs 80. Use water only to wash off paint from the brush. Else wood will absorb water and tend to warp over a period of time. Make sure paints are fresh. If they are old and thick then they can be used as base paint. When you paint the base make sure you also paint the sandpapered area so that the remaining frays on the sides get further smoothened by the smeared paint. There are two ways to look at painting wood. One is to retain the texture of it and give it the grainy look and the other is to quote it with at least three layers of base paint and make it look like a smooth surface. After the base paint (acrylic) is done you can compose your picture in it either directly or using a carbon copy. All painting rules apply here too. Only advantage is acrylic can be corrected, that is, painted over. However, this has a drawback. It leaves a sticky finish on the surface. In the end giving it a quote of varnish will make sure the piece of art remains in tact for a significant period of time. Either your carpenter will be able to do it for you or you can buy yourself varnish aerosol cans from any art supply store. MDF can also be painted on, the only thing is you need to make sure absolutely no water gets in contact with MDF, before during or after the process of painting it. 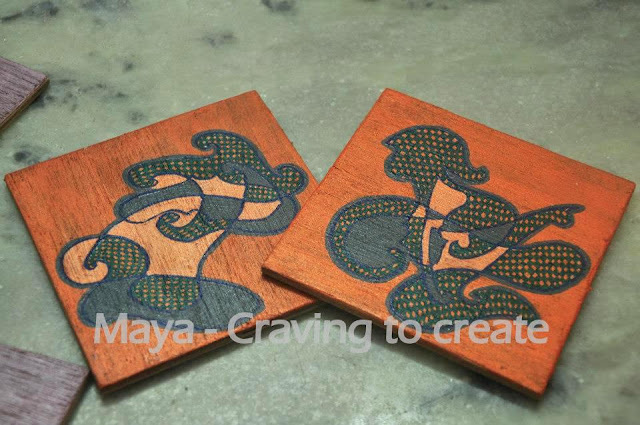 The advantage in MDF is that it can be machine cut into various shapes allowing such a large scope for creativity in terms of art work on it and the usage of that item. Why wood is close to my heart is because it is versatile. It can be used as a base to stick tiles on. It can be used as a frame for a mirror. Photo frames can be made out of up-cycled wood. Glass paintings can be framed with pieces of wood where in you can continue the concept on two different textures. 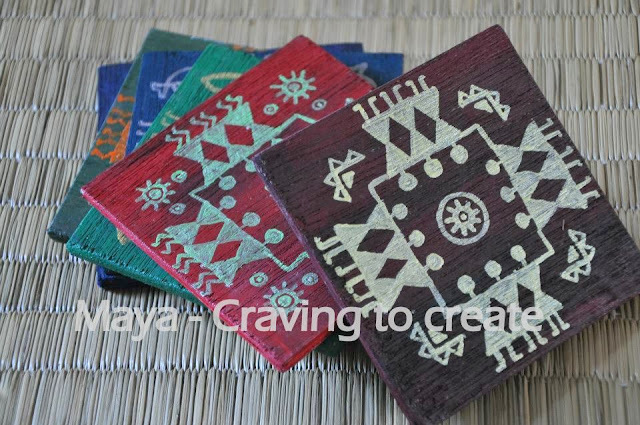 Tea coasters can be made out of small pieces of ply. Pebbles can be affixed on wood because it can bear the weight. So far one of my most favourite works is this one. Although it took me more than two months to finish I enjoyed every minute I spent on it. Get up and grab you piece of waste wood from the nearest ply wood show room and try your hand at it! 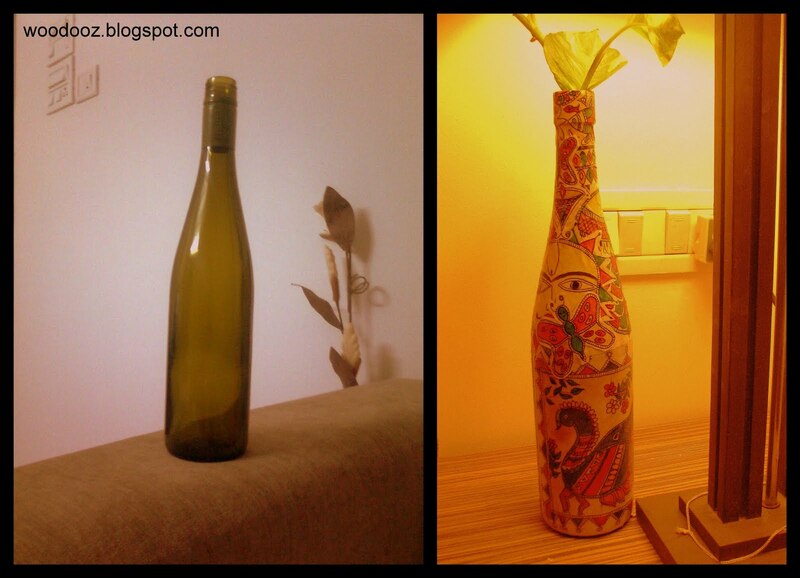 Somu was the one who introduced me to Decoupage and I wanted to try something with it. Decoupage is the art of decorating an object by sticking colored paper cut outs onto it. It could be bits of news paper, color papers, hand painted sheets, interesting patterns on fabric. 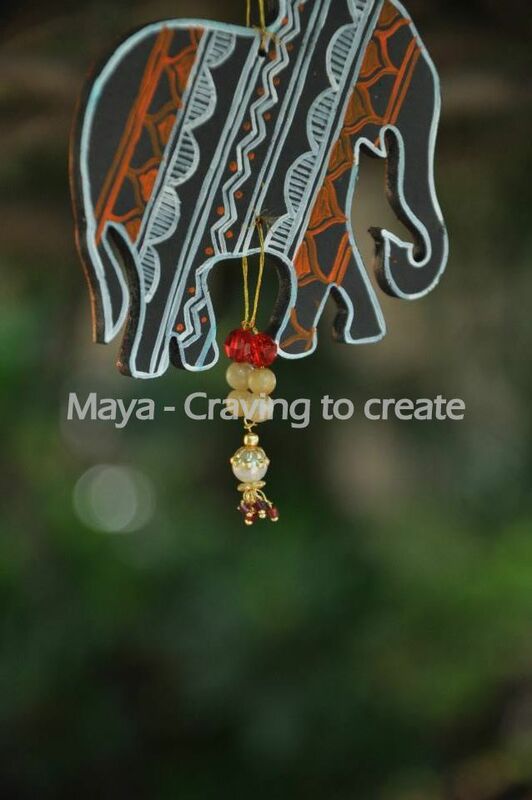 You could choose any object that needs a totally different look, stick the cut outs onto the object using mod podge (an alternate here in Chennai is decoupage glue/hobby ideas-glue n gloss. 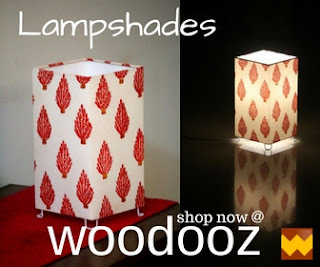 You can get it from Hindustan traders, Ananda/RS stores on LB Road or any craft store). 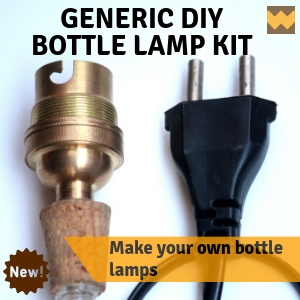 Basically the glue acts like varnish. Each layer of cut outs is glued atleast 6-7 times until the 'stuck on' appearance dissappers and the result looks like a collage painting. Can't find Mod Podge ? Learn an incredibly easy way to make your own Mod Podge using Fevicol !